Use on walkways, driveways, and under trees. Apply directly to weeds in landscape beds and to weeds around vegetable gardens. Remove pull strip to activate batteries. Unfold wand until it clicks into position. Unwrap hose and insert plug at the end of the hose into the spout on the cap. Turn sprayer nozzle to desired setting. Slide switch on trigger to UNLOCK. Slide switch on trigger to LOCK. Fold wand closed and place sprayer back in holster. For outdoor use only. Do not spray plants or grasses you like - they will die. Not recommended for spot weed control in lawns. Do not allow treated weeds to come in contact with desirable plants until spray has dried. For best results, apply on a warm, sunny day. 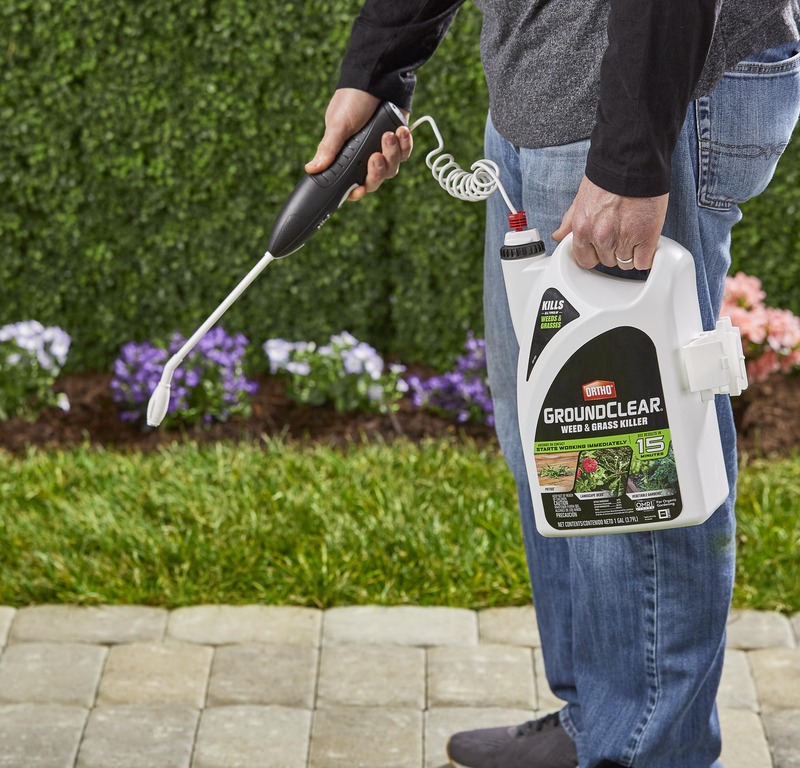 Apply at any time of the year when weeds are small and actively growing. Apply when the winds are calm. Rainproof in 2 hours upon drying. For best results, re-apply every 2 to 3 weeks. Difficult to control weeds, such as perennial or more established weeds, may require several applications for complete control. Your yard is a place to enjoy. That's why Ortho products are designed with care to provide effective solutions to weed problems. Please follow instructions for appropriate usage, storage and disposal. Non Refillable container. Do not reuse or refill this container. If empty: Place in trash or offer for recycling if available. If partly filled: call your local solid waste agency for disposal instructions. Never place unused product down any indoor or outdoor drain. Do not allow children and pets to enter application area until sprays have dried. 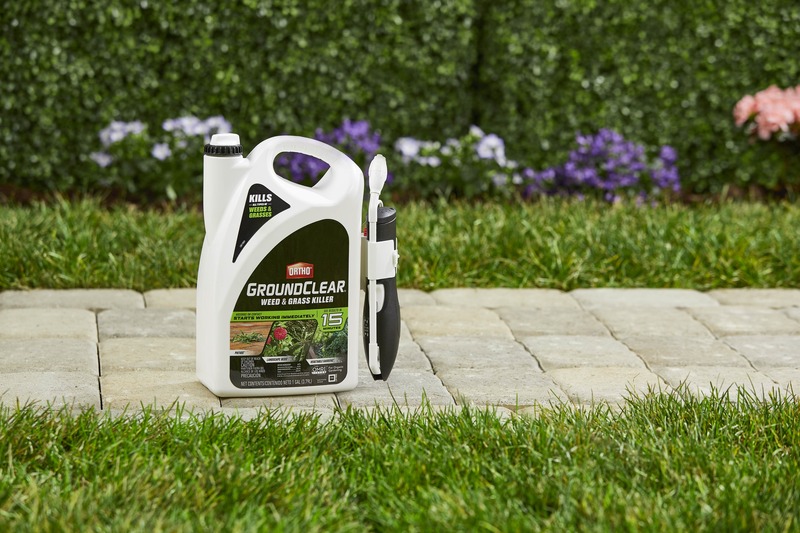 Consumer facing label of Ortho® Groundclear® Weed & Grass Killer Ready-to-Use 1 gal. Acts on contact—see results in 15 minutes and weeds will generally turn brown within hours. 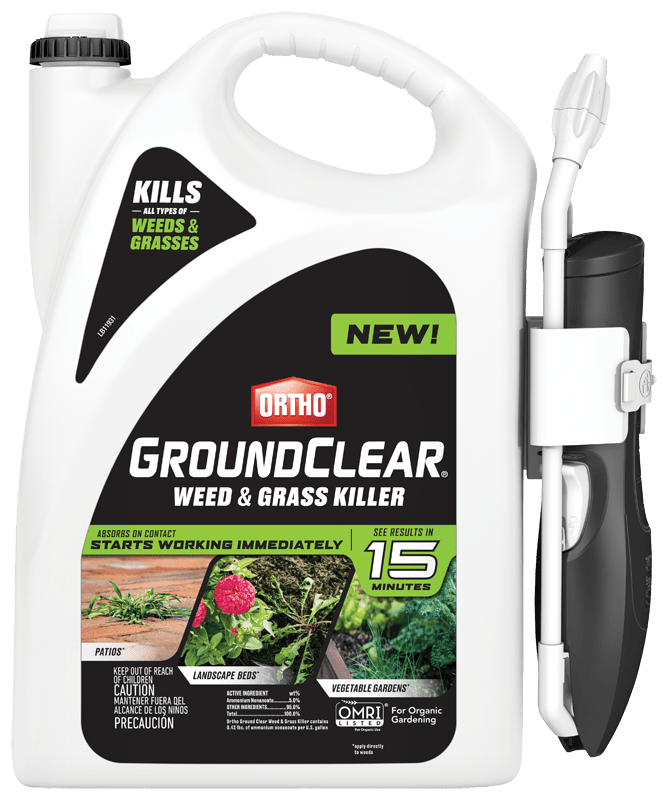 Ortho® GroundClear® Weed & Grass Killer may be used in organic ornamental gardens and on hardscapes around your home. 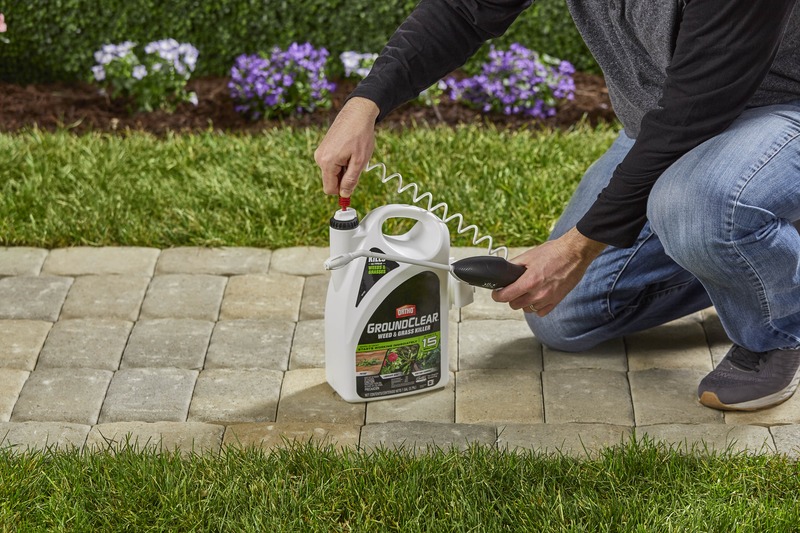 Always remember, non-selective weed killers are designed to kill anything green and growing, so ensure that it is not applied to desired plants. 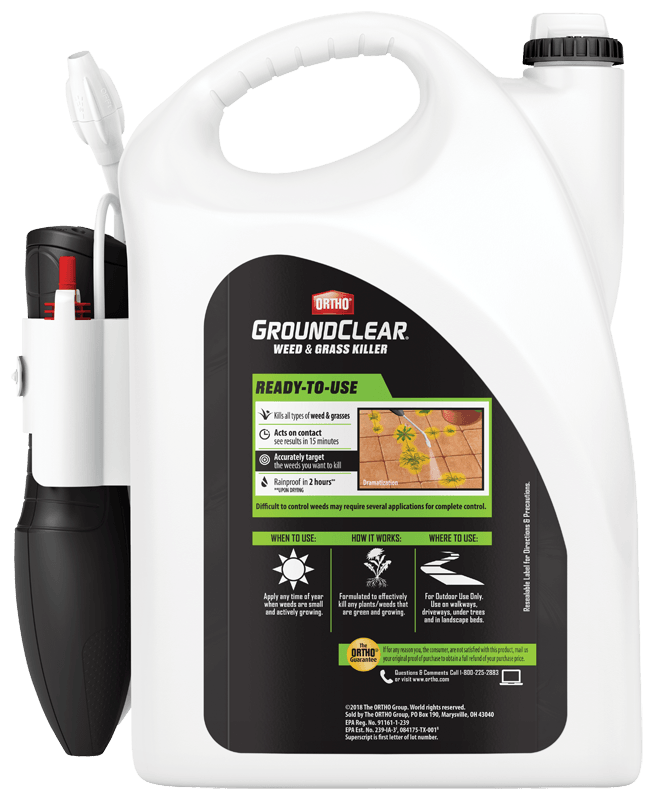 When you want weeds gone fast, reach for NEW Ortho GroundClear® Weed & Grass Killer. Pick up a bottle today. This revolutionary new formula starts showing results in just 15 minutes. 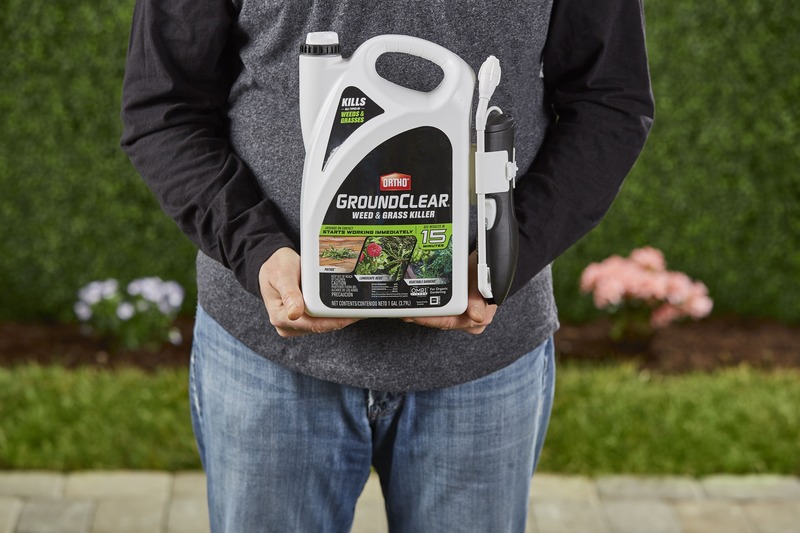 Feel confidence wherever you use it, from patios to around your vegetable gardens and anywhere else you don’t want weeds to grow.